Uber, California's DMV Collide Over Launch Of Self-Driving Cars : The Two-Way Does Uber need a permit to test self-driving cars in San Francisco? "We don't believe we do," the company says. But the state Department of Motor Vehicles disagrees and is threatening legal action. On Tuesday, an Uber driverless car waits in traffic during a test drive in San Francisco. 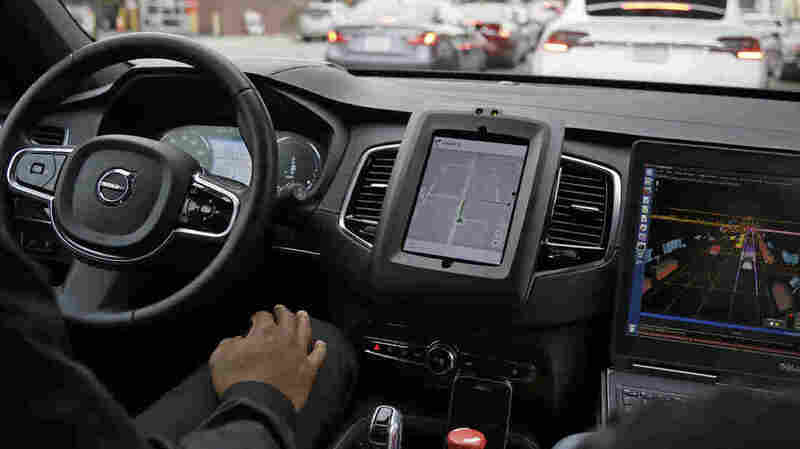 The ride-hailing company is refusing to obey demands by the state's Department of Motor Vehicles that it stop picking up San Francisco passengers in specially equipped Volvo SUVs. Uber has started offering rides in self-driving cars in San Francisco without a permit for autonomous vehicles — defying state regulators, who say the permit is mandatory. Uber's self-driving Volvos, which are operated with a "safety driver" behind the wheel, have already been deployed in Pittsburgh. They hit the roads in San Francisco on Wednesday. The company maintains that because the cars' programming is "not ready" to drive without a person behind the wheel monitoring the automobile, the company doesn't need a self-driving car permit. The state DMV says Uber does need a permit, and has threatened legal action, Reuters reports. Wired magazine suggests Uber is exploiting a loophole of sorts, noting that the regulations, as written, apply to cars that have "the capability" of driving without a person monitoring them. Uber is effectively arguing that its cars' autonomy "isn't good enough" to require a permit, Wired writes. "First, we are not planning to operate any differently than in Pittsburgh, where our pilot has been running successfully for several months. Second, the rules apply to cars that can drive without someone controlling or monitoring them. For us, it's still early days and our cars are not yet ready to drive without a person monitoring them. "But there is a more fundamental point—how and when companies should be able to engineer and operate self-driving technology. We have seen different approaches to this question. Most states see the potential benefits, especially when it comes to road safety. And several cities and states have recognized that complex rules and requirements could have the unintended consequence of slowing innovation. Pittsburgh, Arizona, Nevada and Florida in particular have been leaders in this way, and by doing so have made clear that they are pro technology. Our hope is that California, our home state and a leader in much of the world's dynamism, will take a similar view." Meanwhile, a video that appears to show a self-driving Uber running a red light in San Francisco was posted on YouTube on Wednesday. The footage doesn't show whether the car was in self-driving mode at the time or was being controlled by a person. "Uber said the incident was because of human error — suggesting that the car was not in autonomous mode — and was not carrying passengers, and the driver had been suspended," Reuters reports. The video has more views than Uber's ad, posted the same day, announcing that self-driving cars were coming to San Francisco.